The organization BeagleBoard.org today began selling of the mini computers BeagleBone Black is priced at just $ 45. 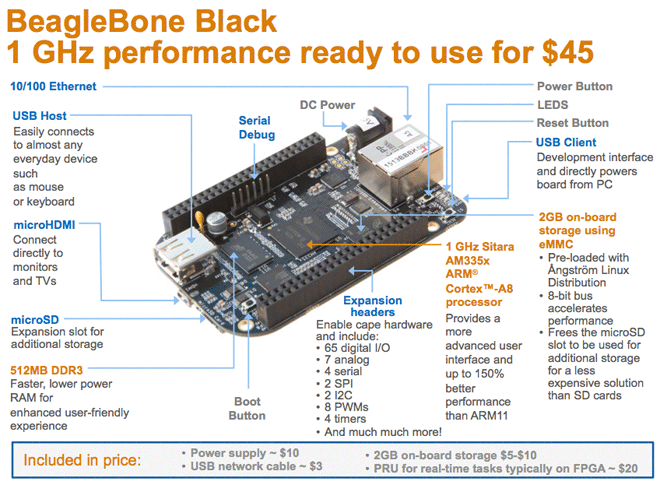 BeagleBone Black has a much more advanced configuration than its predecessor BeagleBone, and thus it is much cheaper. The new model is equipped with processor Sitara AM335x ARM Cortex-A8 1 GHz (manufacture Texas Instruments) and works under control of preinstall Angström Linux, although you can put on your computer and Ubuntu, and Android. It is excellent alternative for those who hasn’t enough Raspberry Pi opportunities for $25. In any sense, BeagleBone Black — it шы already premium class system for portable computers and robotics, it is initially compatible to the Arduino Uno platform. In addition to the powerful processor, the motherboard 512 MB of DDR3 memory and 2 GB eMMC, two connectors USB 2.0, including a microUSB, jack microSD, slot micro HDMI, Ethernet 10/100. Mini-computer of this type is best suited for the design of robots and various mechanical structures in the house and a garage. For example, you can make the switch lights on the light sensor and automatic actuator, opening the door for incoming SMS with a password, and similar devices. To connect the different expansion boards, motors, sensors, FPGA, LCD displays, analog connectors, 3D-printers and other equipment on the motherboard has two 46-pin connectors, one on each side of the board. Processor power (1 GHz) is enough for normal rendering GUI OS and relatively quick work of libraries for image recognition or other software modules.